Acid-based chemical staining provides unique and one-of-a-kind results each and every time it's applied to concrete floors. As the name implies, acid-based stains contain acids - and they are strong enough to harm a person. Special care needs to be taken by those who apply acid stain to floors. Acid stains consist of a solution of acid and water mixed with metallic salts that can be applied in a variety of colors. 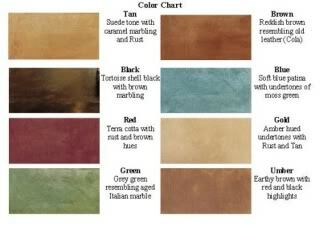 The effect is a natural-looking color pattern with mottled shades of the same hue (source: concreteideas.com). If you are looking to replicate the look of leather, marble, natural stone and more, then you should consider acid staining. Acid staining is not just a finish applied to the concrete. The acid stain starts a chemical reaction by penetrating the concrete surface and reacting chemically with the cement. This is partially why no two acid-stained concrete floors are alike. Each chemical process is unique and each slab of concrete is unique, making for a one-of-a-kind result. If it's a uniform look that you want, you should look into concrete dyes instead, as acid stains do not result in the most uniform finish. Design options such as faux finishing work well with acid staining. 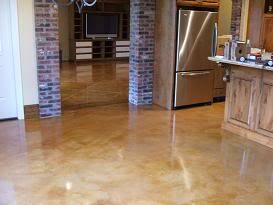 Acid staining can be applied to a new concrete floor or an existing concrete floor. Acid stain can be applied on existing concrete if it is in good condition. But keep in mind that there is another option. If the concrete is deteriorated, a micro-finish or micro coating will provide a new surface that will rival steel power-troweled concrete (Source: stainedbydesign.com). Small cracks or seams in the concrete may become more apparent with the application of the acid stain. Many homeowners don't mind the appearance of small cracks or seams, as it creates a natural look that makes the floor special and unique.